deed that governs priority of claims. First-out provisions: Debt (usually working capital revolver financing) having priority payment position in documented Application of Funds of credit agreements; first receipt of all distributions in bankruptcy, including post-petition interest, even though pari-passu in seniority to long-term debt with respect to asset claims. E.g. Telcordia – senior secured notes = B2, senior secured first-out revolver = Ba1. Subordination in right of payment is considered a going-concern subordination, which says that holders of subordinated debt will be paid interest only after the holders of more senior debt have been paid. They cannot call a default until more senior debt holders have been repaid. Various mechanisms exist to defer interest payments on the outstanding debt in the event of nonpayment. Security/liens grant a creditor the right to sell the secured assets and be repaid from the sale proceeds. If all the shares of a company are pledged as security, this also provides a mechanism by which the secured creditor can sell the company outright. Bank loans are usually secured by assets while corporate bonds are typically unsecured although some are secured on s second lien basis (behind bank debt). 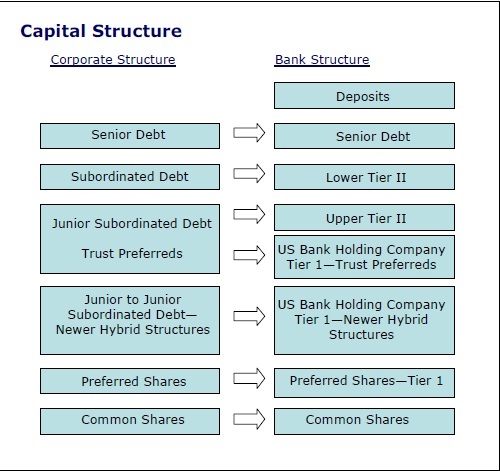 In a corporate structure with a holding company and subsidiaries where each entity has its own balance sheet with its own debt, investors need to be able to differentiate where in the structure the debt lies and what assets it has claims on. In a holding company/subsidiary structure, the holding company owns the equity of the subsidiaries and therefore has the lowest claim on the subsidiary assets behind the debt of he subsidiary. For example, in a bankruptcy, debt of subsidiary A would have senior claims of the assets of subsidiary A. There is a question of whether upstream guarantees or inter-company loans stand up in bankruptcy court. A judge could enforce equity subordination in these cases and rule that the actions are not legal. Issuers are conscious of structural subordination issues and the additional funding costs that come with them. Some market participants have developed structures that may mitigate or even cancel out the subordination. These include upstream guarantees and inter-company loans. A guarantee is a commitment (usually by a subsidiary or parent) to meet an obligation, if that obligation cannot be met by the debtor. Guarantees are usually “joint and several”, meaning that each guarantor is liable for the full amount of the obligation it guarantees; however; Sometimes local law requires guarantee amounts to be capped (corporate benefit). In Europe, senior banks usually require that guarantees (if any) fall away upon certain events or default scenarios, thereby allowing the sale of the business free and clear of outstanding debt. With an upstream guarantee, the OpCo acts as a guarantor to the Holdco. In the event of a default, the assets of both the Holdco and the OpCo would probably be lumped together to satisfy both the guarantor and the beneficiary. As a result of the guarantee, the debt obligations of both entities would share the same level of seniority and would rank pari passu. The pari passu clause is very common in credit agreements of all kinds and simply indicated that there is no subordination of any type between two classes of debt. For various reasons, firms with international operations tend to incur debt locally. In order to mitigate structural subordination, the foreign subs will guarantee the debt of the holding company on a senior basis. Another way of overcoming structural subordination involves the use of inter-company loans from the Holdco to the OpCo. When the Holdco extends a loan to the OpCo, it becomes both a creditor and a shareholder of the OpCo. This loan could also rank pari passu with other obligations of the subsidiary, thereby eliminating structural risk. Contractual subordination implies a seat at the table for all creditors at that company. In the event of a restructuring, highly negotiated position between banks, bondholders and equity. In the event of a sale of assets/liquidation/sale of company, the courts usually allocate proceeds according to priority. Structural subordination implies no seat at the table for subordinated creditors (creditors of a different company). Structurally senior bank debt has a clear preference. In the event of a restructuring, the negotiations could be between the bondholders and the equity as long as the bank debt is un-impaired. In the event of a sale of assets, proceeds will flow to bondholders only after the banks have been paid out, either through loans or through equity. 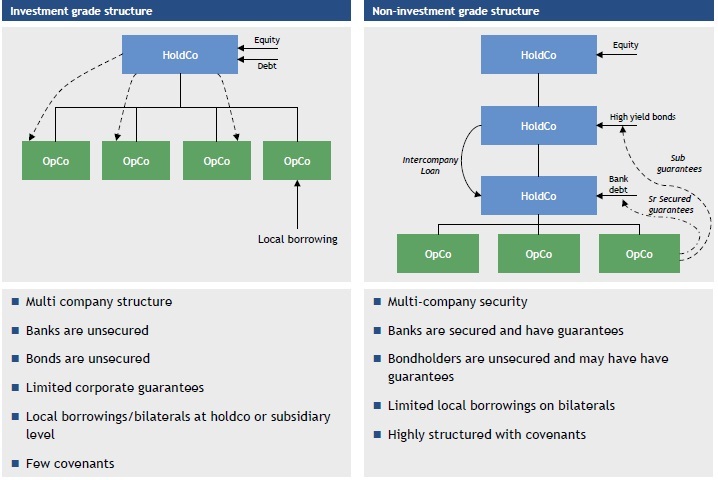 The following chart shows the typical investment grade and high yield corporate structures.